On Golden Pond is a classic American movie. And like many classic American movies, I've never seen it. Also like many classic American movies, it was a successful Broadway play before it was a movie. The 1979 play was adapted by playwright Ernest Thompson into the 1981 movie starring Katherine Hepburn, Henry Fonda, and his real-life daughter Jane Fonda. I'm glad that I haven't seen a lot of these old movies so that I'm able to experience them first in their original form - on the stage. And one of my favorite stages on which to see such work is Yellow Tree Theatre; these small-cast character pieces are what they do best. 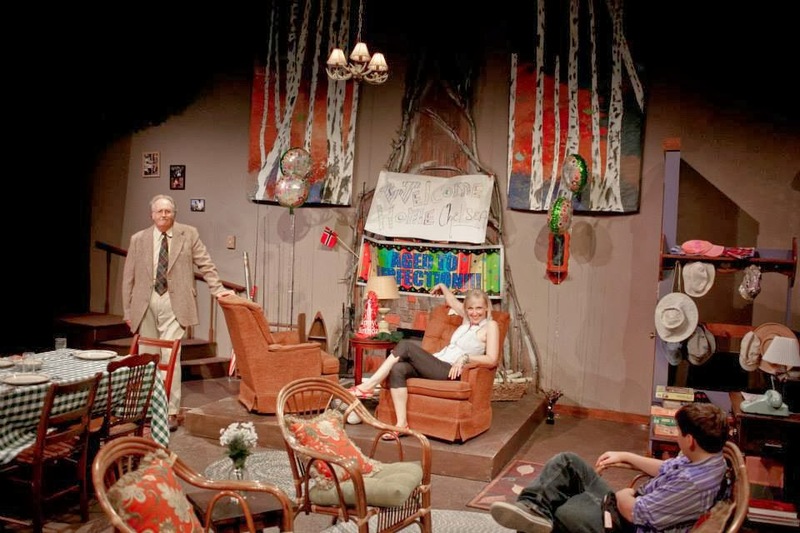 This play is truly delightful, with real-life married couple and veteran Twin Cities theater artists Jon Cranney (who also directs) and Katherine Ferrrand serving as the heart of the play. On Golden Pond takes place one summer at the family cabin, something many of us Minnesotans are familiar with. Even though the original play and movie were set in New England, it feels very Minnesotan. In fact, they've changed a few place names so that this version does take place in Minnesota, which feels very natural. Anyone who visits a cabin "up north" knows that it's a special place, a place of respite, away from the busy life of the city. 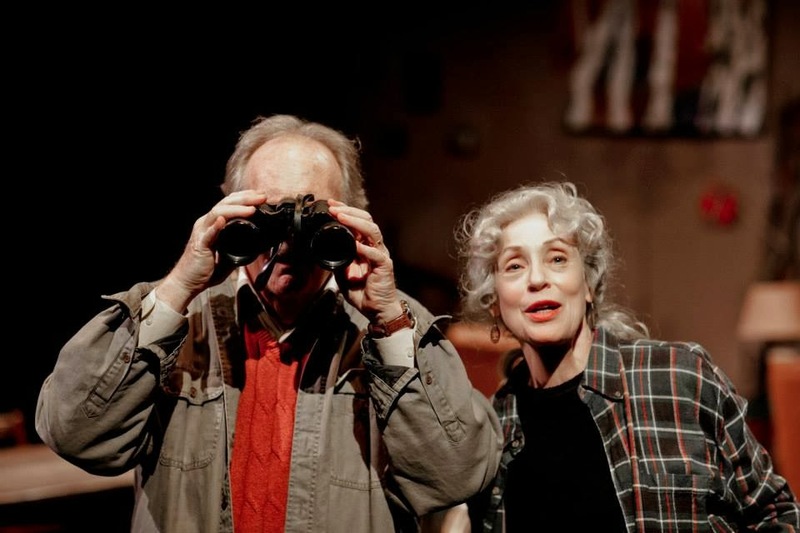 Aging couple Norman (Jon Cranney) and Ethel (Katherine Ferrand) have spent summers at their cabin on Golden Pond for over 40 years. This particular summer, their daughter Chelsea (Melanie Wehrmacher) visits from California to celebrate Norman's 80th birthday, bringing along her boyfriend (Stephen Pearce) and his 13-year-old son (Jack Alexander). Mailman and family friend Charlie (Michael Lee) completes the picture of life at the lake. Not a lot happens, other than fishing, skinny-dipping, and drinking coffee, but much is explored in the relationships between father and daughter (they never got along), mother and daughter (mother is frustrated that daughter can't get along with father), grandfather and step-grandson (they become fast friends and fishing buddies), and husband and wife (Norman suffers from ill health including heart problems and memory loss). It's a lot like being at the cabin, you don't really "do" much, but life is full. At the center of this very fine cast are Jon and Katherine, who, understandably, are very natural as the long-married couple. 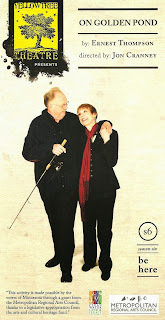 Jon is appropriately cantankerous with a dry wit, and Katherine is simply radiant. Michael provides much comic relief and character as the mailman who's really more like a member of the family. Melanie, Stephen, and Jack complete this family well. As usual, Yellow Tree makes the most of their small space, which is jam-packed with rustic furniture, books, hats, games, and other cabin accoutrements. The set (designed by George Marsolek) is so inviting that I wanted to take a seat on one of the comfy chairs, dig into one of the books on the shelf, and have a cup of coffee and a biscuit with honey and butter. 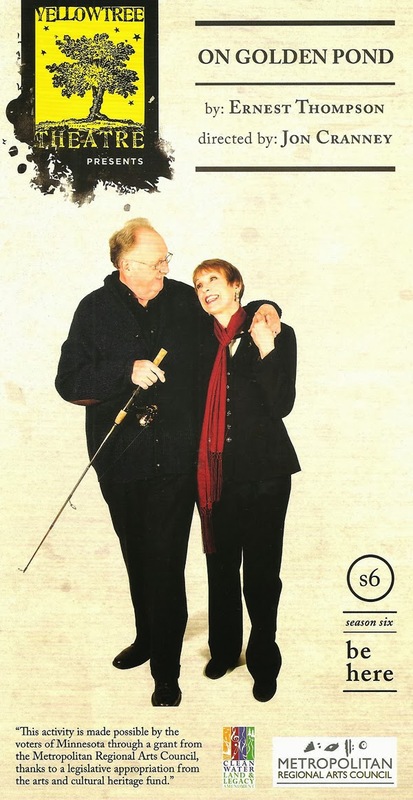 On Golden Pond is the first play in Yellow Tree Theatre's sixth season and continues through October 13. The five-play season includes a remount of the original version of the hugely popular holiday series, Miracle on Christmas Lake, and concludes with the hilarious 39 Steps next summer. If you have yet to take the trip to Osseo, now is the time to "be here." And for dinner before the show, I recommend Ethnic Foods Company's new restaurant Collage Global Cafe, in the space previously occupied by Nectar Wine Bar. They've only been open a week or two so they're still working out a few kinks in service, but what doesn't need work is their food, which is delicious, local, fresh, and healthful. It makes for a great "dinner and a show" night in Osseo!